Between The Posts is a podcast powered by revolutionary goalkeeper glove brand Renegade GK. Host, Tyler Vaughan has created a podcast for all coaches, players, and parents where his inclusive nature provides a platform for those seeking to make a positive impact on the next generation of soccer players. 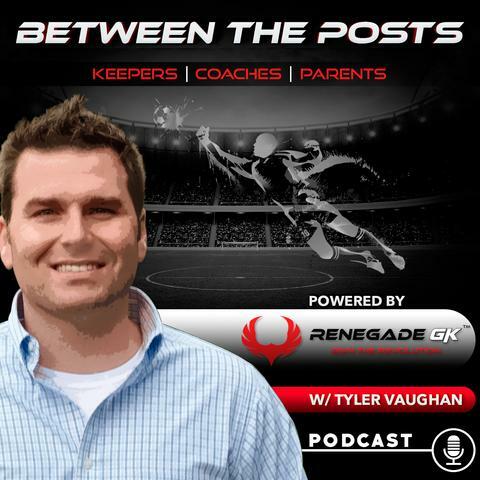 Many of the Between The Posts episodes deal with the specific position of goalkeeper yet Tyler also host brilliant coaches with resumes miles long to offer a comprehensive approach to many of today’s most relevant technical, tactical, and philosophical topics facing our modern game. No matter whether you’re looking for goalkeeper specific concepts or simply soccer related content that will challenge you as a coach next training session, it’s all available on Between The Posts. In line with the children first approach to coaching Tyler and Coach Karl Dewazien began to discuss ways to partner using the Between The Posts platform as a launching point. We decided it best to tackle a common pain point facing coaches at all levels, PRACTICES. Coach Karl has comprised an all-star list of strategies and lessons that led to the forming of this very comprehensive “9 Step Practice” approach which has been developed over decades of coaching. Much like we seek to do on our podcast, Coach Karl has done for years with others in the profession and led coaches to focus on player level He has created an ongoing, progressive conversation around player development and coaching education. As you listen to this mini-series Tyler and Karl deliver the 9 steps with context and relevance that can be applied to any skill level and age. No matter whether you’re the big club or the small program, this mini-series will challenge your stylistic approach and encourage your own self re-discovery as you consider decades worth of strategy rolled up into bite size chunks. Coach Karl’s ability to paint the picture for listeners is one of the best we’ve ever heard. His commitment to the player first mindset not only will inspire your next season but also challenge what has become the over complication of a simple game. On behalf of Renegade GK, Between The Posts, and Tyler Vaughan, we thank you Karl for taking part in our show and giving our audience your genius perspective, years of expertise, and continued dedication to our players!